With this special offer you will receive one (1) Seychelle pH20 Pitcher 32oz with Case. The streamlined pH2O PUREWATER Family Pitcher provides up to 100 gallons of great-tasting, high-quality pH water. The pH2O PUREWATER filter naturally alkalizes your drinking water to support your bodies delicate pH balance. 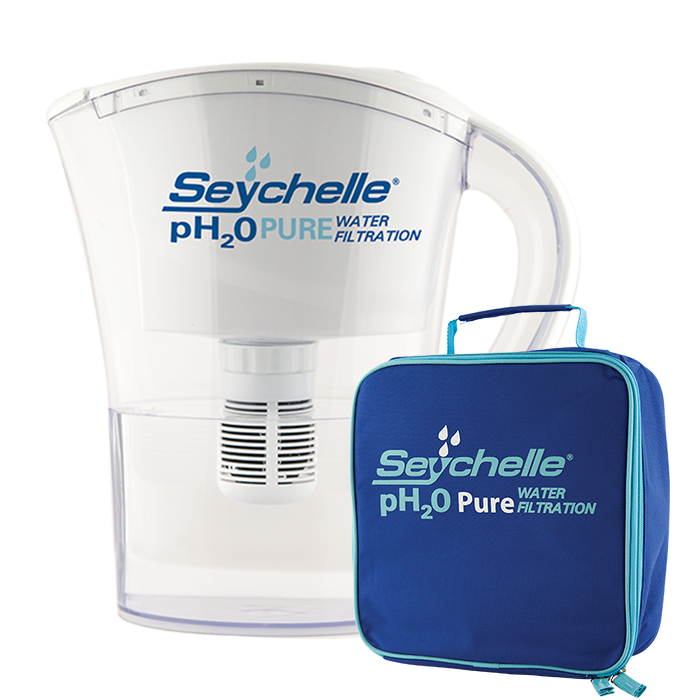 Seychelle’s pH2O PUREWATER proprietary blend of adsorption media naturally creates, pure, great-tasting alkaline water, removes harmful contaminants, while protecting beneficial trace minerals to improve your health and wellness. Filtered water remains alkaline for over 30 days! Aesthetics – offensive tastes, odors, chlorine, silt, sand, and sediment. Chemicals – industrial VOCs (Volatile Organic Compounds), PBCs, THMs (Trihalomethanes), detergents; Agricultural SOCs (Synthetic Organic Compounds), pesticides, DDT, etc. Dissolved Solids – harmful heavy metals such as Aluminum, Arsenic, Asbestos, Cadmium, Chromium 6, Fluorides, Copper, Lead, Mercury, etc. Enhances pH– Naturally enhances the alkalinity of source water up to 9.5 pH*. We promise to be your trusted partner and are focused on ensuring that you are satisfied with your purchase. If you’re not satisfied for any reason, our return policy allows you to send back most merchandise within 30 days* of the date of receipt of your package for an exchange or a refund of the purchase price, minus the shipping and handling and return label fees. If an item is returned as defective or because PTL Shop was in error, PTL Shop will refund the S&H paid and not deduct for the Return Label. For more information, call Customer Service at 877-528-2525. *For Cell Phones and Electronics, please note that we have a 14 day return policy on those items. In the event that an item is received that is incorrect or was not ordered, please contact Customer Service at 877-528-2525 before returning the item. Step 2: Repack all contents in the original packaging. Some items consist of several parts or pieces. Always return the entire item or set for a replacement or refund. Returns Using the Return Label: Contact PTL Shop Customer Service for return label. Return the package to one of the carriers listed on the Return Label. Charges for the Return Label appear right on the label. Your return fee is deducted from your refund, or in the event of exchange, charged to the credit card used for the original order. Purchasing insurance is not necessary because it’s included with the label charges. For returns due to PTL Shop error or item defect(s), there’s no charge for use of the Return Label. Returning through a shipping carrier of your choice: Visit our website Ptlshop.com to print off your return form. Select ground service and insure the item for full value of the merchandise being returned. Send your package to the PTL Shop return address provided on the Return Label. Please note: For returns, credits to a credit card will be applied upon processing, but may not appear on your statement for one to two billing cycles. How much does it cost to use the Return Label? Return Label fees are deducted from your refund and are based on the original weight of your item in its original packaging. Return Label costs are subject to change at any time, without prior notification. Restrictions and limitations may apply. Connected Devices: Please make sure that all data has been removed and the device is no longer linked to any cloud account or to any other device, so that we may accept the return of this product. Final Sale and Non-returnable Items: All Final Sale merchandise cannot be returned. Other non-returnable purchases include custom orders, prepaid cards, gift packaging, memberships, and items returned that are damaged through customer use, or that are returned in unsanitary conditions, or that are missing major contents. Opened Computer Software, Movies, Music or Electronic Games can only be exchanged for an identical item. Apparel: We are happy to accept returned apparel that has not been used, worn, laundered and that still has its original tags attached. Bundle or Promotional Discount Items: If you return an item bought as part of a bundle or with a promotional discount and you do not return everything, we will still accept the return, and will reimburse you for what you do return, minus the value of the discount or promotional product. Morningside Church, Inc. and PTL Shop are not responsible for returns lost during shipment or any failure to deliver item(s) due to an incorrect shipping address being supplied. Please contact Customer Service at 877-528-2525 to make changes to the supplied shipping address. Items are usually shipped within 2 weeks of the date the order was placed. Please allow a maximum of 4-6 weeks for delivery on all orders. Shipping for orders outside of the United States, Canada and Puerto Rico is not available. Item(s) will be delivered to the shipping address supplied when the order was placed. Morninginside Church, Inc. and PTL SHOP are not responsible for any failure to deliver item(s) due to an incorrect shipping address being supplied. Please call Customer Service to make any changes to the supplied shipping address. Available Monday-Friday 8:30am-12:15pm ET | 1:15pm-5:45pm ET | 6:45pm-9:00pm ET. Contact us if you still have a question about our Shipping Policy. Signup for our mailing list to receive special offers and promotions!